Peaches and Greens began with an old UPS truck serving to offer fresh fruits and vegetables to the residents of the Central Detroit neighborhood. A year after her success with the produce truck, Lisa Johanon, executive director of Central Detroit Christian (CDC), was able give the truck a brick-and-mortar home in what was once a derelict laundromat. 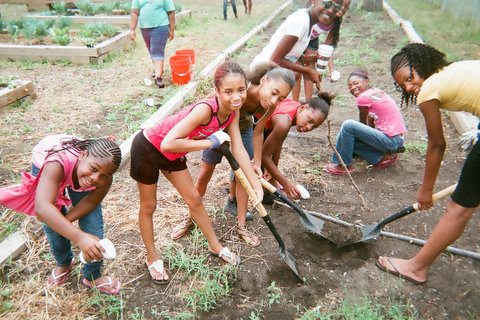 At the same time, CDC developed community gardens to source the produce, grown by neighborhood teens. 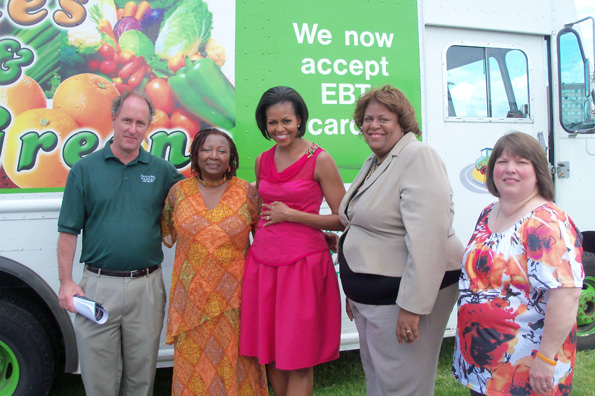 This grassroots effort to remedy the problem of food deserts in Detroit attracted nationwide attention and during a May 2010 visit, Michelle Obama helped deliver vegetables around the neighborhood. Three years after Peaches & Greens opened its doors, CDC invited PPS to help them build on this early success. With support from The Kresge Foundation, we joined them in drafting a plan to transform the storefront produce stand into a well-stocked grocery store and health-focused community space. After preliminary meetings with CDC and the staff managing the store, PPS conducted a placemaking workshop with neighborhood stakeholders at Café Sonshine, a soul food restaurant a block away from Peaches & Greens also managed by CDC. The workshop was attended by close to thirty community members, who helped identify pressing needs throughout the community and began the process of developing recommendations to address them. But the group also recognized the need to elicit wider community participation and input in the planning process. “Why not host a party?” someone suggested, and the group enthusiastically rallied behind the idea of a community Harvest Festival to be held in October, featuring a shared meal, games, music, dancing, free food, a talent show, horse-drawn hay rides and, of course, some placemaking exercises. Critical to the event’s success was the decision to hire a local resident to assist with planning and do community outreach (including going door to door distributing invitations). The first hurdle came early. The plan to use the store as the focal point of the festival required closing Third Avenue to traffic for the day. Fearing that they would never get a permit from city hall in time, Lisa Johanon called the local police precinct. The precinct chief, familiar with the good work CDC had been doing in the neighborhood, agreed and said, “how can we help?” The phone call concluded with an agreement that uniformed police officers would not attend the event. Organizers made a conscious decision to ensure that all felt comfortable and welcome in order to get attendance and buy-in of the full community. Despite chilly temperatures and dark clouds the morning of the event, over 450 neighbors attended the Harvest Festival. The rain held off and it turned out to be a great day filled with fun, good food and roasted marshmallow deserts. The event inspired community goodwill in the project, while simultaneously allowing CDC and PPS to test out activities and amenities for the spaces surrounding Peaches & Greens. PPS staff had the chance to engage the community in a relaxed setting, making personal connections and hearing their stories. At a busy “Placemaking in Detroit” tent, PPS staff used fun visuals to encourage community members to identify important places in their neighborhood, comment on proposed improvements, and contribute their own ideas for activities and amenities for the area. Conversations highlighted how important Peaches & Greens was to the community. However, it also became apparent that many community members were not able to fully benefit from the store’s offerings. Some people simply could not cook – not for lack of interest, but as a result of the economic realities faced many households in the neighborhood. A number of families were either squatting in abandoned housing without working kitchens or sharing crowded apartments. It became evident that what the community really needed were gathering spots where people could create new economic opportunities. These conversations reframed the agenda for the community working group. The placemaking goal became to transform a single produce store and the spaces around into the core of a neighborhood Main Street that would provide social and economic opportunities and serve as a connecting point around food. The vision of a community kitchen took hold, along with the idea to add an indoor “front porch.” A community meeting space was also added by building an extension to the market and was finished in 2013. CDC now offers cooking and baking space for neighbors and entrepreneurs in the new kitchen as well as a home base for Peaches & Greens’ sliced fruit business, which distributes to schools throughout the city. Each year, up to 70 community members of all ages participate in cooking and nutrition classes in the kitchen. The classes spark new friendships and casual discussions of new ideas for neighborhood improvements. A decision to create a separate entrance to the new meeting room to which neighborhood groups have a key allows them to convene meetings even after the store has closed. Symbolically and practically, having a key to the building has increased the community’s attachment to the place. Another important element of the community’s vision was the development of an adjacent vacant lot into a neighborhood park with basketball courts, lawn games and a picnic area. Neighbors worried about late night activity at the basketball court are pleased with CDC’s creative solution: a removable hoop that players need to “check out” from the store. Across the street from the store, a new shed houses the local domino players who gather every day in front of an abandoned gas station. The domino players provide “eyes on the street”—a big contribution to neighborhood safety and security—and now enjoy an attractive structure that gives them weather protection and has also been used for a number of spontaneous community celebrations. Currently, CDC operates numerous programs and facilities in vacant lots throughout the neighborhood. For example, there are two community gardens, two hoop houses, an orchard, a aquaponic farm operation, a laundromat and fitness center (“Fit and Fold”), and outdoor exercise pods. A newly hired fitness expert from the community helps neighbors to familiarize themselves with the new community resource. DETROIT Remade employs community members, tasked with salvaging and restoring items found in vacant buildings. A teen farming program educates area youth about food production, from seed to sale. The Harvest Festival at Peaches & Greens is now an annual event—one of the few gatherings in which the entire neighborhood comes together. This event not only reinforces Peaches & Greens role as a community center, but it continues to be an avenue wherein people can share their ideas for improving the neighborhood.